What a gorgeous spot. They even have their own waterfall right behind the property, complete with a trail that leads you up to the top. Highly recommended! The next morning we got coffee at the hotel cafe. The Polish girl working the counter was very friendly and helpful. Please pass along our thanks to her. Was cozy and cute. well located between Vik and Jokulsarlon. Groceries and a cute restaurant close by. 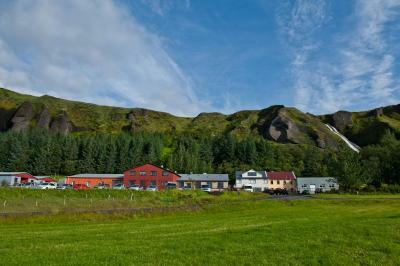 The view from our room was very pretty - countryside and Icelandic horses. The bed was comfortable and it was nice to have the private bathroom and coffee/tea. Staff was friendly and helpful. The room was very big and the matress really comfortable! I liked the location right off route 1 and I liked the value. Checking in and out was also very easy. Amazing staff. Exceedingly friendly! Great dinner! The surrounding view is extraordinary and very beautiful. Staffs were very helpful and informative as well. Would definitely come back again if given another chance! Very comfortable and spacious room, location very close to the ring road and easy to find, quick check-in. Great location, clean facility, comfortable bed, and nice staff. Waterfall right behind the facility and a nice hiking trail up to top to great views. Offering a restaurant, Klausturhof Guest house is located in Kirkjubæjarklaustur next to Ring Road. Free WiFi access is available. Each room here is heated and has a view of the natural surroundings. The bathroom facilities are private or shared. At Klausturhof Guest house you will find a garden, a terrace and a bar. An array of activities can be enjoyed on site or in the surroundings, including hiking. The property offers free parking. Notable attractions include Skaftafell and the town of Vik which can be reached within a 50-minute drive from the property. When would you like to stay at Klausturhof Guesthouse? This quadruple room has a view. House Rules Klausturhof Guesthouse takes special requests – add in the next step! Klausturhof Guesthouse accepts these cards and reserves the right to temporarily hold an amount prior to arrival. Only had a half-functioning coffee machine (with no coffee pods). Would have preferred to have a kettle in the common area. Beautiful location, steps away from a beautiful hike up a mountain overlooking the town. Affordable and convenient location. Comfortable and clean. The facilities at Klausturhof Guesthouse were excellent - just what was needed for our single night stay. The complimentary tea and coffee were well received as well. Staff were friendly and helpful and the Guesthouse is located near a restaurant and supermarket. The house was freezing cold when we got in, I wish someone had turned on the heating before our arrival. It was a convenient stop on our way to Vík. The location and the surrounding area are stunning. The receptionist was super helpful and nice and gave us great tips on what to see in the area so it was a shame that the weather wasn't good enough for us to explore it. For our restricted diet, it was difficult for us to prepare our meal ourselves in the room (because no kettle is provided). It was hard to go back and forth to the cafeteria to get the hot water especially when we are with elderlies. The room was spacious and very clean. Even the shared toilet is clean! In a nutshell: AVOID THIS PLACE Where to start... -Cleanliness: the room was disgusting. There is no simpler way of putting it. I found stains on the duvet, the corners of the room were full of dirt and the bedding just seemed like it hadn't been washed in a while. Didn't smell clean at all. Attaching photo for reference. -Staff: we went to ask for a plate from the reception (any plate or surface). They said "this is not a hostel, you should have booked a different place". -Value for money: extremely expensive for what it is. There are far better options for the same price. -Comfort: Very uncomfortable mattresses, weird decoration, very low quality little houses with a bathroom to share with 4 rooms in total. The surrounding area is decent - that's about it. We were not offered the option of breakfeast when we booked. We got the option of adding it when we checked in though, which was nice. The staff was nice. Check in and out was easy. The area was super nice, surroundings beautiful. Clean beds and toilet facilities super. Bad shower, no kettle at the room, reception does not work 24hours.